Apart from burning to a crisp and sipping cocktails in your own private shaded banana lounge, there is quite a bit to do on the island of San Andres. I got used to island life during my four-day visit and here’s what I suggest travellers get amongst if they’re lucky enough to visit this beautiful part of the Caribbean. There are day tours available by bus on the island which is shared with other visitors, but I opted to hire my own gold buggy for the day and discovered the island on my own and at my own pace. I hired a buggy through my hotel for $60,000COL (around $30) for three hours. I drove around the entire island, which took probably about two and a half hours, stopping and starting along the way. You’ll get the opportunity to see the entire coastline of the island and the smaller towns, shops and homes which are away from the main tourist area in the centre of town. This is a great way to begin your stay in San Andres so you can get a better feel for the size of the island, where everything is, and where you want to visit again. My visit to the Acuario and Johnny Cay were probably my favourite parts about the entire trip to San Andres. Again, I organised a tour through our hotel which cost us $15,000COL (approximately $7) to visit both the Acuario and Johnny Cay and then a further $4,000COL ($2) each for the government’s ecological tax at Johnny Cay. The Acuario is a natural aquarium at a small island sand-bank close to San Andres. Just off the shore there are fish, sting rays and other sea creatures. And because it is so close to the shore, you don’t really need to know how to swim – just paddle in the water and swim with the fishies. But for the adventurous, grab your snorkel mask and get out there. After visiting the Acuario I jumped back in the boat and zipped along to Johnny Cay which is about 15 minutes away. One of the natural wonders on the island is the water geyser or El Hoyo Suplidor. It’s only active in certain conditions, but lucky for me it was putting on quite a show when I paid a visit. You’re bound to be approached by local kids on the island asking to show you where the geyser is, where to get a drink, and whether they can take your photo for you. Have a chat to the kids if your Spanish allows for it, make a bit of a joke with them and they will be sure to take care of you. 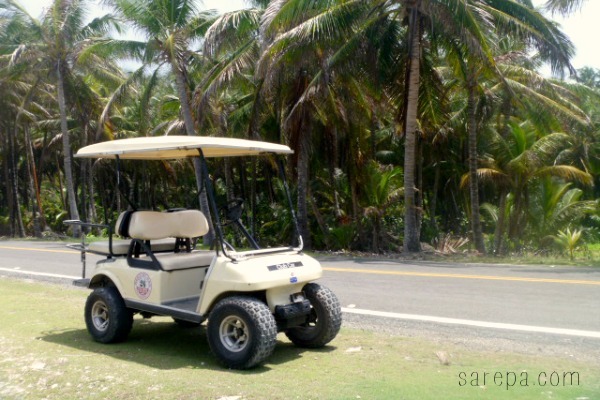 Our “guides” brought me a Piña Colada and took care of my golf buggy by sitting in it and pretending to drive it. But, they were good kids. I chatted to their mum, who made my cocktail, and she said they were in school and could speak English and Spanish. Spanish being their second language. Give them a tip if you come across them, why don’t you. There are some great places to go snorkeling in San Andres including La Piscinita, West View and El Cove. In the coastal reef surrounding San Andres there is around 50 species of coral and it’s home to varying marine life including dolphins and tropical fish. If you’re a diver, there are a bunch of PADI-affiliated dive school on the island, too, including Sharky Dive Shop and Blue Life. And, you won’t be at a loss of places to dive either, there are more than 35 dive sites, including caves and shipwrecks, in the area. Sure, there’s something cheesy and oh so white about a blonde girl getting her hair braided while in the Caribbean. My hair is too thin to get this done without losing 80% of my hair anyway, so I didn’t do it. But I saw a lot of travellers walking around with their new braided ‘do. Expect an insta-afro when you take it out once you get home, too. As well as the golf buggies, there are also bikes for hire. They’re a quick and easy way to get acquainted with island and island life. I didn’t actually come across the bikes for hire until it was too late, so look out for them if you want to step you relaxing beach vacation up a notch. Although San Andres is a small island, there are still some great spots for sightseers. Check out The Hill, a lookout point and the highest part of the island – at the summit you’ll find the island’s oldest church. Or there’s Morgan’s Cave, which is said to be where pirate Henry Morgan hid his treasure. The island of San Andres is a duty free zone which means a lot of things like alcohol, candy and perfume are cheap as chips. If you’re an alcoholic or buying souvenirs for friends and family back in Bogotá, be sure to leave a couple of hours on your last day to stock up. And, of course, a visit to the Caribbean just wouldn’t be complete with some relaxed beach time. If you’re adventurous you can hire a kayak, windsurf, kitesurf or jetski. Or, you could just grab your towel, a book, perhaps your snorkel mask and lap up the good life . A crab I spotted while at Johnny Cay. A man selling coconut and mangoes on the beach. A hotel in San Andres. Two stray puppies curling up together. People getting around on the island. Me getting around on the island. Colourful cocktails ready to be drunk here. 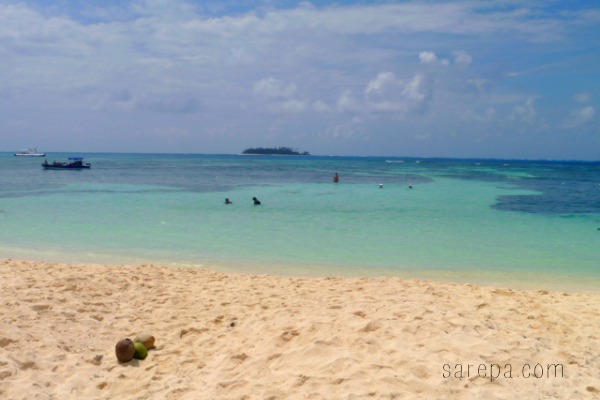 Have you been to San Andres? What did you get up to? Sharing is caring, let me know in the comments below. Pingback: Beaches in Colombia and a technology detox | sarepa. Pingback: A trip to Santa Marta, Colombia | sarepa. Awesome in depth post. I just landed on the island so will be checking all of this out! The island of San Andres. What a fantastic part of the Caribbean. On your recommendation, we have gone ahead and booked. Looking forward to it. Sharon recently posted…Which are the 5 best full face snorkel masks & which to avoid? How fantastic, Sharon! Have fun!